Cats seem to be highly entertained by random household items like cardboard boxes, balls of yarn, and bubble wrap. If you have boxes that your cat seems to like playing in, you can decorate the boxes and put toys in and around them that further entertain your cat. Most cats love catnip. Sprinkling catnip on your cat's favorite toys can really get them going by increasing their willingness to play and how much time they spend playing. Cats might expend a little bit more energy when buzzed on catnip. Even larger kitties might be tempted to trot about when they've got nip in their systems. You can use catnip grass, sprinkles of catnip or catnip spray to entice your cat to play with more toys. Despite the numerous hours they spend sleeping or hunting birds from the comfort of a windowsill, cats are mobile creatures. 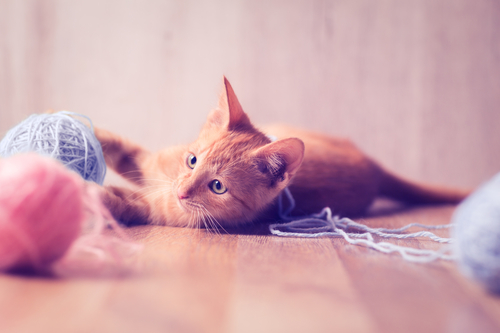 Playtime should be interactive, and many cats enjoy visually-stimulating activities like chasing laser pointers or bubbles. While regular bubble solution is generally okay as long as your cat doesn't try to lick up the soap, there are catnip bubble solutions on the market that can be fun for cats to play with. If you use a laser pointer, allow your cat to "catch" the light instead of having them endlessly chase it. This can help to satisfy their natural hunting urge. Always involve treats in playtime, especially at the end. When you notice your cat starting to slow down, offer them a few treats. If they seem somewhat energetic, you can make them work for the treat by sitting up or chasing a treat across the room. Once they've worked for that treat, however, give them a few treats that they do not have to work for so that they will feel prompted to play again next time. Make sure to also give them some head-scratches or belly-rubs to help them relax. Change up what you do during different play sessions, and make sure you keep positively rewarding your cat after each session. If you have more than one cat or have other pets, get them involved in group playtime. Dogs and ferrets (who share a similar hunting and playing style with felines) in particular seem to play well with their cat housemates. Make sure to devote equal time, toys and treats to each pet you involve in playtime, even though it is okay for those who tire out more quickly to stop sooner than others. We need to instruct your puppies the right place to dispose of. Your central goal, should you acknowledge it, is to give your puppy the best evident choice out of a constrained determination. VitaLife Chicken Jerky Dog Treats are made with 100% chicken breast—the same quality meat that you would choose to eat. When it comes to dog treat recipes, VitaLife knows that less is really more and that why there are no added preservatives, colors, flavors, sugar or spices.